Pumpkin Spice took the nation by storm in the new Millennium and has become one of the hottest flavors people look for – and not just when Autumn rolls around each year. Pumpkin Spice evokes Thanksgiving – a time when family and friends come together and reconnect. After all, what would Thanksgiving be without grandma’s pumpkin pie? Now you can have all those creamy cinnamon, nutmeg and pumpkin flavors in our 24 count Pumpkin Spice Single Cups. Enjoy a cup of rich, smooth, 100% Arabica medium roast coffee, and you don’t have to wait for Fall to enjoy all the good feelings that come with each sip! 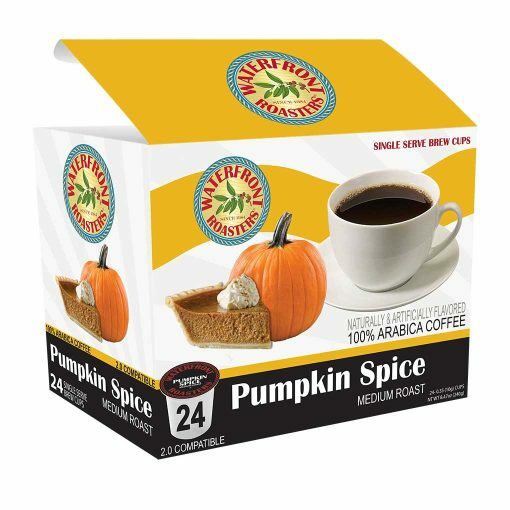 Waterfront Roasters’ Pumpkin Spice flavored coffee has become our most popular flavor of all. Who doesn’t love the aroma and taste of fresh-baked pumpkin pie? Enjoy it year-round in this smooth, rich coffee.